A top welterweight contender's match on August 27th as Carlos Condit and Demian Maia battle each other for UFC in Vancouver, British Columbia! When PeachMachine writes "UFC Condit vs. Maia Live Recap by PeachMachine IN PROGRESS" as the headline hit F5 or refresh on the post for the latest updates! Rd1: Dance dance revolution early. Kennedy now slamming hands. Nobody in trouble yet. Kennedy worked all round for a takedown at got it with 20 seconds left and did nothing. 10-9 Kennedy. Rd2: Kennedy again pushed him into the fence. Some good action against the cage. Kennedy gets another takedown. Kennedy landed some big shots to end the round. 10-9 Kennedy. Rd3: Kenned dominates against the cage again. A boring round. Ricci 10-9 Kennedy. Result: James Kennedy wins by unanimous decision on scores of 30-27, 30-27, and 29-28. Peach Points: Skip it. A flat 6 if ever. #AngryMarks - Also, I bet around 10 bucks on every fight straight up. So far, I'm down 10 bucks. Kennedy was a hometown boy and he got some mic time with Stann post fight. He moves to 9-0. Rd1: Labrise was fined 20 percent of this purse for missing weight. I've got 10 on Gouti to win 25. I always pick against guys who miss weight. For one, I want them to lose, and for two, something went wrong with preparations. Gouti snapped off a few jabs. DDR on the cage. LaPrise drilled him and dropped him! And it is all over! TKO for Chad LaPrise. Result: Chad LaPrise wins by TKO at 1:36 of round 1. Peach Points: It was a straight right on the chin that did it. And now I'm 0-2 and down 20 bucks. Maybe LaPrise should pay me 20% as well for cheating. He said he would be moving up to 170. Rd1: Silva stops him early with some hard shots. TKO. Result: Felipe Silva wins by TKO at 1:13 of round 1. Peach Points: Wow! I didn't see that coming. I'll take it. Still down 9. The Magnificent Seven looks awesome. We've got the nerd translator in the ring. Someone needs to get that dude an adult haircut. You're on TV. Stann gave him the opportunity to call someone out, and he didn't. Where's the dudes manager in his ear after the fight giving him a name in case that come up? Rd1: DeChirico has family in Italy that have been effected by the earthquake. McLellan drilled him with an uppercut and looks to be finding his range. DC as he shall now be called, is cut under his eye. DC looks flat. He's just lunging in with one shot. This is a close round. DC 10-9. Rd2: McLellan got a take down then DC hurt him with some elbows. McLellan looks like Keith Jardine with his ear busted open. DC drills a double leg take down. He's into to McLellan's half guard and is looking to punish. DC may have grabbed the cage to prevent a takedown, but the ref didn't see it. This is another really even round but I have DC 10-9. Rd3: McLellan comes out swinging. Oh zaa, I just saw that I get ROH TV and it's coming on at 7pm. I may have to go to duel coverage, just like my award winning Olympic coverage during UFC 202. DC got his back and looked to finish but fell off. McLellan lucks into top position. DC has more in the tank but not by much. A big shot by DC lands. DC 10-9. Peach Points: This was a bloody war. 6's all around. Ok, I'm up a dollar. C'mon Peach, know when to walk away. Rd1: Since I did zero research on any of this card, I'm expecting to go .500 and lose a little. Barzola has been showing flashy kicks all round. He's just flinging kicks willy nilly. Bochniak gets a takedown and looks to pass. Back to the feet, Barzola has thrown more shots but I'm not sure how much damage he's done. 10-9 Barzola. Rd2: Neither man landed solid much. Still looks like we're in the DDR phase. Barzola keeps yelping when he throws a kick like he's Monica Seles. That's a deep pull. Barzola pretty much dominated without doing any damage. 10-9 Barzaola. Rd3: I'm glad that Wildling found work after he was killed in Game of Thrones. Spoiler alert. Now Bochniak starts to work. He'd better becasue he's losing. Both guys are bringing it to close the round. Bochniak 10-9. Peach Points: The fans booed the decision. I think the wrong guy won but either score was possible. Neither guy really won. This is why we need more draws. 6. I'm up 11. Rd1: Casey made it a grind on the cage. DDR. Nobody has landed anything. A late flurry by Alvey may have won him the round. 10-9 Alvey. Rd2: This was all Alvey and he got the job done at the closing seconds. He was patient and finally saw an opening and connected for the TKO finish. Result: Sam Alvey wins by TKO at 4:56 of round 2. Peach Point: Another big finish for Alvey. I like this guy. He's a talented 6. Sam cut an amazing baby face promo. He called out any 205 pounder on the undercard of Hendo vs. Bisping 2. He really did a great job on the mic. Stann kept trying to cut him off but he should have let him keep rolling. Bet: 13 to win 10 on Lauzon - At this point I'm up 11.50. At this rate, I can retire when I'm 2000. Rd1: A very fast pace early. Pretty hot action for the first two minutes then Miller went for a spinning attack and fell and gave Lauzon the upper hand in top position. JoLa did some damage on top but Miller got up and landed some shots on the feet. Miller's takedown was stuffed and JoLa looked strong to end the round. 10-9 Lauzon. Rd2: Miller's output was really high for 3 minutes. It was like JoLa was bating him to get tired. JoLa played a lot of cover up. Then Miller went for a kick and again slipped and JoLa fell on top. This time, Miller did more damage from underneath. Miller 10-9. Rd3: Miller came out really strong and looked to finish and that may have cost him as he's in trouble now with 2 minutes left. JoLa has his back, and now Miller switches. Theyr'e throwing for the bonus. This has been really close. Any score is possible. Miller went for a head and arm throw and gave up his back with 30 seconds to go. Miller went for the roll and Lauzon got mount and dives on the arm bar in the closing seconds. 10-9 Lauzon. Peach Points: I'm pretty sure Joe Lauzon is the toughtest man on the planet and Miller only slightly less. These guys just eat pain for breakfast. I think JoLa won, but whatever. Now, I'm down 2.50. I got greedy. Miller put over Lauzon big. Bet: 20 to win 10 on PVZ. Rd1: I regret my bet. You gotta be committed to pain with the skull tattoo. VanZant throws a wild spin kick that misses. Bec laughs it off. Paige eats a left hand. She's doing a ton of dancing. I can't bring myself to make the obvious pun. Nobody really did much damage. 10-9 Rawlings. Rd2: Oh me, oh my! It's over! PVZ throws a crazy kick that lands and she follows up with some gnp for the finish. It was a dirty switch kick that did the job. Result: Paige VanZant wins by KO at :17 of round 2. Peach Points: A star is re-born (Shout out @findevan) as PVZ gets it done in spectacular fashion. She gets me out of the hole and now I'm up 7.50. Barely minimum wage. PVZ credited her dance moves. She wants on the December card in Sacramento, for some reason. Stann interviewed Punk who was wearing a Blackhawks jersey. Stann cut the promo for Gall. Punk no-sold it. He looked calm and confident. Rd1: Oliveira's game plan is to use BJJ. He spent a lot of time working for a takedown. Pettis landed a body shot that really hurt him and Oliveira dropped to his back to get guard. Oliveira gets his back but now Pettis escapes. Oliveira is taking a beating. 10-9 Pettis. Rd2: Why is no one pointing out that Pettis is basically cheating by fighting at this weight? You can't be the champ at heavier weight and then drop a weight class. That's cheating. This early weigh-in thing is doing the opposite of what they want. Pettis doesn't want any part of Chuck on the ground. Pettis is much bigger. He lands some hard shots. Oliveira looks like he's waiting to get knocked out. Both men landing flurries. Pettis is winning for sure in the distance... unless Oliveira can submit him as he jumps on Pettis's back and sinks in the body triangle. Pettis breaks out and now we're punching. A takedown at the end of the round for Oliveira. That's huge. Oliveira 10-9. Rd3: Oliveira shoots in early and gets a takedown. He's got time to work. He's got side control. Pettis shoots his hips up for an arm bar. Don't sleep on his jits. He subbed Bendo. Some really nice BJJ scrambles. They're too sweaty now. Pettis hooks up a guillotine and it's over! Result: Pettis wins by submisson, guillotine choke, at 1:49 of round 3. Peach Points: Man these two are great athletes. Too bad one of these men clearly is a dirty dirty cheater. Now I'm down 2.50. Thanks a lot, Charles. Rd1: Whelp. Maia got his back. It's over. Submission. 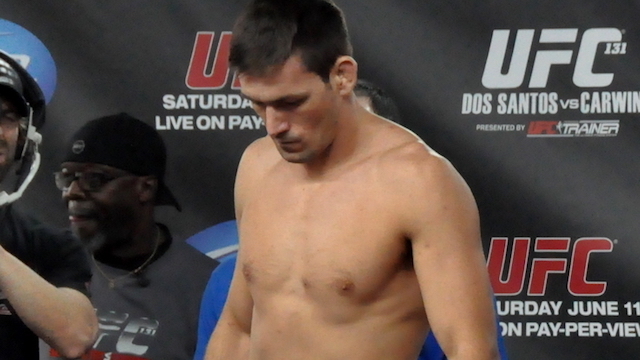 Result: Demian Maia wins by submission, rear-naked choke, at 1:52 of round 1. Peach Points: That's how you use BJJ to shut down a killer and that's what makes Maia so awesome. Classic 6. Maia is crying. A lot. Too much. He said he thought of Condit as the champ since he beleived that Condit beat Lawler. He wants to wait for the winner of T-Wood and Wonderboy. Condit just said that he didn't know what was next. Summary: Hey UFC, listen up. This show ended at 10pm eastern and it only had 10 fights. THAT'S PERFECT! It's the perfect amount of UFC in an evening. This was a pretty average card. I can't believe I just wrote that. I'm so spoiled. We got amazing finishes by Maia and PVZ and Alvey and a war with Miller and Lauzon. I'm just pissy about losing 13.50. Doh!